A chic and refined cane that is robust enough for everyday use. 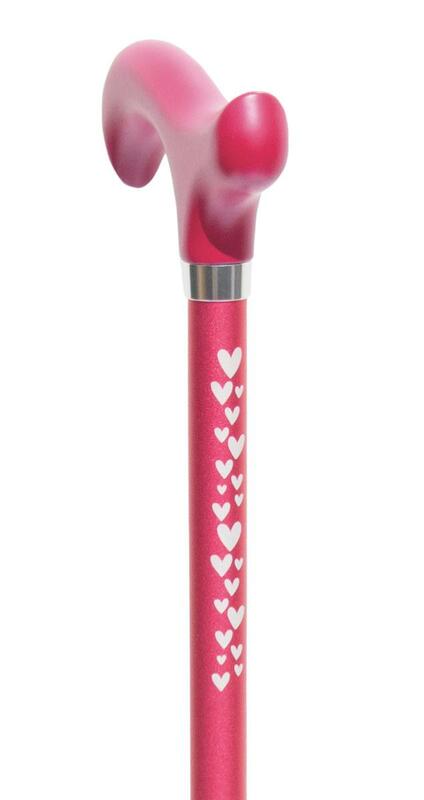 The height-adjustable pink aluminium shaft is printed with a sprinkling of varying sized white hearts down the first 12cm (approximately 5") of the shaft. This walking stick is adjustable in height from 70 to 93cm (approximately 27.5 to 36.5") and is fitted with a chrome collar and a non-slip black rubber ferrule. The elegantly shaped derby handle is made from hardwood painted pink to complement the colour of the shaft and offers excellent support to the hand. Item weight 260g. Ferrule diameter 16mm.